We trust the vehicles in which we rely on daily to be properly tested for safety. Unfortunately, too many auto manufacturers and makers of auto parts fail to adequately test these machines. When they fail or there is a vehicle defect, the consequences can be catastrophic personal injuries. According to court records, the crash occurred five years ago when plaintiff driving a van collided with a boat that was being towed by another vehicle. At the time, plaintiff was driving his two sons and eight other people on a return trip to St. Louis following a Boy Scout camping trip in Minnesota. The initial impact of the crash didn’t cause significant damage. However, the van plaintiff was driving swerved and rolled at a relatively low-speed. Plaintiff was wearing his seat belt, but still slid far enough out of the seat for his head to connect with the roof of his van, dislocating his neck and severing his spinal cord. Nobody else in the vehicle was seriously hurt. The injuries rendered plaintiff a quadriplegic, with no motor movement below his chest. He was, however, able to gain partial function of his arms following a nerve transplant and extensive rehabilitation. Plaintiff was able to resume his work as a medical doctor after several months, but his practice has been significantly impacted in that he is not able to see as many patients and he has great difficulty even completing routine tasks. His quality of life was severely impacted, as he is no longer able to bike, sim, hike or maintain his previously active lifestyle. He also has significant concerns about how the future will unfold. Some form of care will be required for the rest of his life. 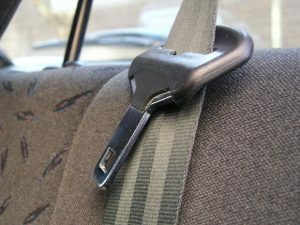 Seat belt did not have a pretensioner, which is a device that activates in a crash and takes away the slack from a seat belt. Vehicle’s seat belt system was not properly tested for rollover crash scenarios. Jury decided the case in favor of plaintiff, awarding $1 million. However, trial court granted defense motion for a judgment as a matter of law, finding a lack of evidence to support the jury’s decision. Plaintiff appealed to the 8th Circuit, which reinstated the jury’s verdict. The appellate court ruled there was legally sufficient evidence upon which a reasonable jury could find vehicle maker liable for negligent design.